Visual Studio 2017 solution. Microsoft SQL Server database. Includes C# and VB source code. This tutorial shows how to display a shift schedule for multiple locations/positions. The shift schedule overview page uses DayPilot ASP.NET Scheduler to show assignments for all locations. Locations are displayed on the Y axis. This page shows assignment for a location selected using a DropDownList. The selected location is stored in the ClientState property (ClientState["location"]) and is persisted during the subsequent callbacks. The ClientState is updated and a refresh is requested whenever the users selects a new location using the DropDownList (see onchange attribute). 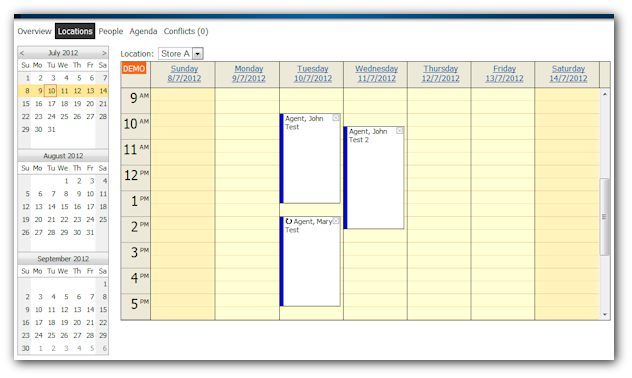 This page shows assignments for the selected person (DropDownList) in a week view using DayPilot ASP.NET calendar control. Again, we are storing the selected person id in the ClientState and calling commandCallBack('refresh') after the first page load. The Command event handler reloads the events. 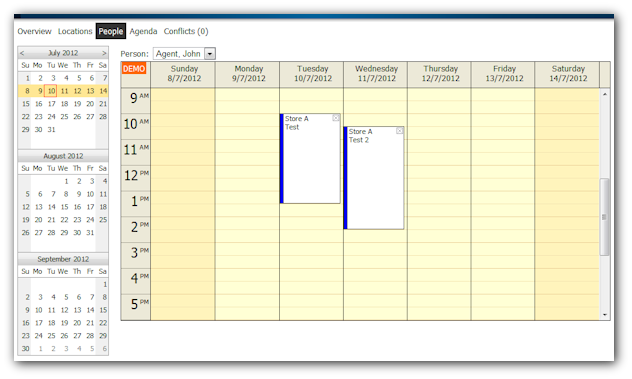 Agenda is a simple GridView of the upcoming assignments for the selected person. Conflict means there are two or more concurrent assignments for the same person. The afterRender() function sends an AJAX request to ConflictCount.aspx and updates the menu with the returned HTML. ConflictCount.aspx uses the ConflictDetector class to check for blocks of overlapping events and return the number of conflicts. The Conflicts page uses ConflictDetector class to analyze a data set for overlapping events. The ConflictDetector accepts a DataTable with event records. 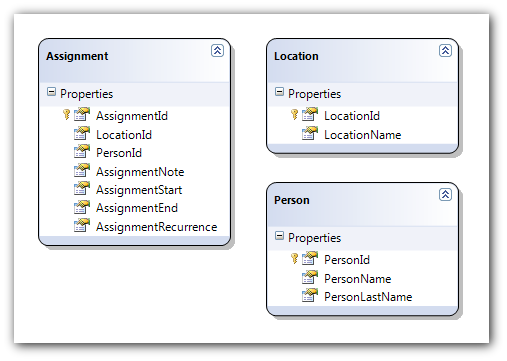 You need to specify the column with assignment start ("AssignmentStart"), assignment end ("AssignmentEnd"), and with resource identifier ("PersonId"). It will check for overlapping events with the same resource id, within the range specified by "start" and "end" variables. public DateTime Start; // Start of the conflict (start of the first conflicting event in this block). public DateTime End; // End of the conflict (end of the last conflicting event in this block). public int Level; // Conflict level. The max parallel event count. public string Resource; // Resource id. Adding [AssignmentRecurrence] field to the [Assignment] database table. Extending the New.aspx and Edit.aspx dialogs with the recurrence rule definition support (UI and database storage). Extending all database loading methods to load recurrence definitions. Regular events can be loaded using the StartDate and EndDate range but the recurrence definitions must be loaded from the past as well. Detecting the recurring events in the update events (EventResize, EventMove). Expanding the rules into individual occurrences manually before showing the data in a GridView (Agenda.aspx). For simplicity, the exceptions from the recurrence rule and not allowed. There are three tables in the database: Assignment, Location, and Person.